Like Twilight, The Hunger Games and Divergent before it, author John Green’s The Fault in Our Stars is a bestselling young adult novel that’s been adapted for the big screen and about to make its way to a theater near you this summer—June 6, to be precise. While the novel recently released in paperback on April 8, its hardcover counterpart was named one of Amazon’s “Best Books of the Month” back in January 2012. And considering the here-today-gone-tomorrow shelf life of most books that don’t feature sparkly vampires named Edward Cullen or high-stakes plotting in a dreary, post-apocalyptic world, the continued popularity of The Fault in Our Stars is nothing short of remarkable. In fact, I’d argue that it’s a story with a Catcher in the Rye level of staying power because of its unabashed honesty and themes that’ll never go out of style. Rather than go the traditional love story route with the lead characters, part of what makes Stars such an engaging read is that Hazel Grace and Augustus meet in a support group for kids with cancer. Like Holden Caulfield, they’ve both got their fair share of angst and refuse to accept clichés and society’s accepted wisdom. But Green is careful not to make them too wise beyond their years to be believable. No doubt, they’ve been through a lot with fighting cancer, but they refuse to let the illness define them. Like any teenager, Hazel and Augustus worry about conforming, their place in the world and being vulnerable—not just with each other, but their parents and friends. They worry about the present, the future and where their relationship is headed. But because they understand that life is short, an insight that’s particularly vivid when you’ve been close—or closer—to death, the way they set out to experience life, through reading, travel and conversations, is moving. Green has a keen ear for dialogue and a uncluttered but still-affecting way with words that really translates. 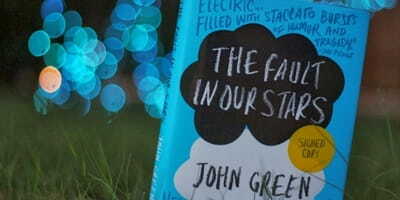 The Fault in Our Stars is one of those books that’s practically impossible to put down, and one can only hope that what made it such a great read will translate to film with Shailene Woodley and her Divergent co-star Ansel Elgort in the lead. Unlike so many books that are fun but disposable, The Fault in Our Stars is the rare read that’s both entertaining and substantive. Never pandering to sentimentality, something that’s definitely a temptation for a story of this ilk, Green introduces readers to two very real protagonists who find genuine connection in the midst of illness, a novel they can’t stop reading and by simply opening up to each other. Without heading into serious spoiler territory, it’s a story that’ll stick with you for the long haul as it explores mortality, meaning and life in a way that never minces words. For anyone who’s wondered what it’s like to live with cancer, it offers fascinating, harrowing insight into a world that’s fraught with uncertainty. But even in their struggles, the daily ups and downs, The Fault in Our Stars underscores the power of having someone to share the load with—a love that’s patient, kind, never proud, self-seeking, always protects, always trusts, always hopes, always perseveres.